The farrowing crate is a metal enclosure in which sows used for breeding are kept shortly before and after parturition in order to keep their piglets safe. 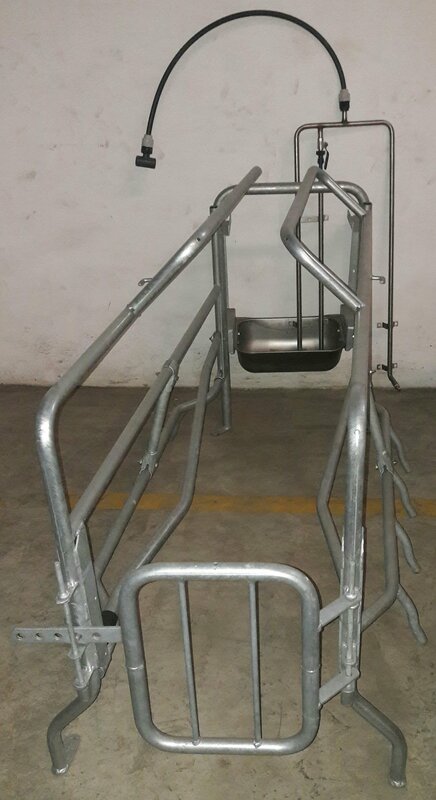 It is designed in such a way that it is impossible for the sow to lie on the piglets, this provides the right environment for both sows and piglets in the farrowing house as well as help to minimize mortality and maximize growth rate of the piglets. The farrowing crate is a uniquely coupled metal cage in which pregnant sows are housed from approximately five days before birth. This continues until their piglets are weaned at approximately 28 days of age. This equipment helps reduce piglet mortality as it reduces the risk of the piglets being crushed by the sow by controlling her movements, particularly when lying down. Economical: When compared to most indoor housing options, the farrowing crate is relatively economical. Space Saving: a typical farrowing crate can fit into a floor footprint of only 3.6 square meters per sow and litter. Efficient: the farrowing crate allows efficient working conditions. They facilitate relatively high levels of hygiene and minimal mucking out. Safe: as the sow is constrained to the dimensions of the crate, it affords relatively safe conditions for stock people, especially when having to handle piglets. 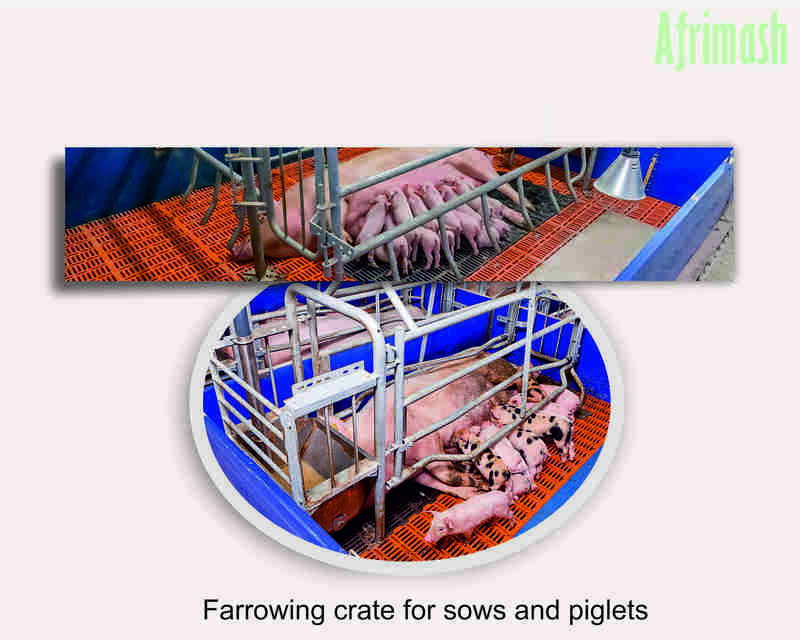 Farrowing crates are thus considered to be economical, efficient and safe with maximizing piglet survival. Fixed or adjustable keep-off rods, thus reduces the risk of piglet losses due to crushing. Provides sow with a comfortable resting area. Can be adjusted in width and its design allows for a complete opening. Easy tiltable trough for thorough and easy cleaning. Big Dutchman has planned and realised feeding systems and housing equipment for modern pig and poultry production already since 1938. We offer you practical, economical and environment-friendly solutions all geared to future needs. Big Dutchman is the recognised market leader in the entire industry. Across five continents and in more than 100 countries, our name stands for long-lasting quality, rapid service and unsurpassed know-how. Our innovations have had considerable impact on livestock management and will continue to do so. We plan to make sure it will remain that way. Kindly be informed that we do not accept returns or exchanges unless the supplied items are defective. For defective items, we accept notification within 24 hours of confirmed delivery and reception. Once we are contacted and informed of the defects, we will review the evidence then proceed with the approval of return as well as options for a refund. If you ordered for a specific product delivered in good condition, such products are not eligible for returns. We do not accept returns if you received the specific products you ordered for. Such cases will involve you placing subsequent orders for the other products without an option for return of previously ordered products or refund of payment. Thus, we advise our customers to review the product information pages, pictures and contact the listed customer care numbers for more inquiries for further clarification.